Good news! Hay House is offering another great free online event. This one is focused on health and healing. 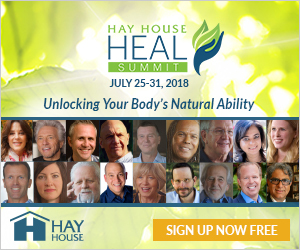 The HEAL Summit begins runs from July 25-31. During that week, you’ll have access to high quality videos of renowned physicians, healers, scientists and researchers such as Dr. Joe Dispenza, Marianne Williamson, Michael Bernard Beckwith, Anita Moorjani, Gregg Braden and others. Each of the 18 lessons in this Summit is packed with healing wisdom that was gained over a lifetime by each of these experts. You’ll learn so much about your body and your health, and each day features a different topic and experts. You’ll learn about healing your heart, your gut, even spiritually. You’ll also learn the Nine Reasons People Heal Spontaneously—you know, all those “medical anomalies” doctors can’t explain, when a Stage 4 cancer patient’s cancer miraculously disappears. Turns out, it’s not so miraculous after all… there’s a set of rules, even you can follow to become one of these “anomalies,” too, no matter where you are in your disease progression. You’ll also learn how to heal your gut in weeks (even after antibiotics), train your nervous system to relax, even heal mental illness.